What would it be like to brand an entire festival from start to finish? This project involved choosing a festival, creating a brand identity, then producing all the necessary advertisements, apparel and web. Three logo concepts form the basis for the festival. The final logo choice represents the iconic Iowa State Fair Grandstand building as well as a Ferris Wheel bordered by the state outline. A bold slab serif font complements the mark. With the final logo chosen, it’s time to create marketing material. Crazy, fun and tasty new food is one of the Iowa State Fair’s biggest selling points. Each year, vendors create amazing new concoctions in hopes of attracting fair patrons. This ad campaign centers around the various “food on a stick” items that can be found throughout the fairgrounds. A good poster demands a bit of inspection and appreciation. 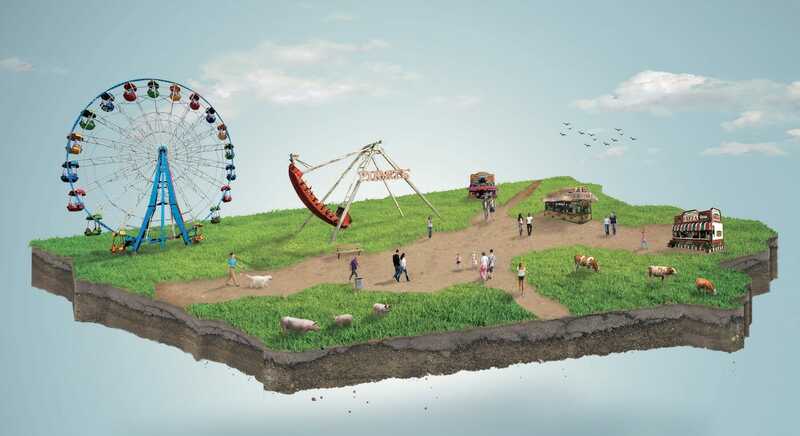 This Iowa State Fair poster features a floating outline in the shape of the state, filled with fair patrons, rides and more. Click on the image below to see a larger version. How about a fun souvenir or two to take home with you? Stickers, shirts, coffee mugs, baby onesies and tote bags round out a collection of items to commemorate the Iowa State Fair experience. A great festival demands a great web experience. The Iowa State Fair web site brings together elements from posters, ads, and more to create a cohesive branding experience. A simplistic, easy-to-navigate app features maps, event calendars and a “Food Finder” to help locate a delicious snack or two. Click here to download a PDF copy of the Iowa State Fair web site redesign.